INTERESTED IN APPLYING behavioral marketing, behavioral economics or neuromarketing ideas to your daily marketing thinking? 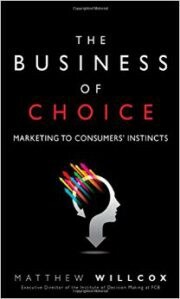 The Business of Choice: Marketing to consumers´s instincts is the book to read. Its author, Matthew Willcox, is the Founder and Executive Director of the Institute of Decision Making (FCB). Willcox, a brand strategist by trade, makes the book entertaining, easy to read and, at times, even manages to add some humor –no easy feat considering the density of the topic. As online we are slaves to brevity, popular tags and lists I will try to summarize the book in ten ideas hoping to intrigue you enough to read it. The Choices humans make are driven by evolution. Think of consumers (or Choosers) as hominids whose brains were wired to survive the harsh conditions of millions of years ago. Ignoring is Decisional Bliss. As most of our behaviors are unconscious, ignoring rational information (cognitive biases) and creating emotional mental shortcuts (heuristics) are survival strategies. When in doubt, consumer’s gut feelings always go for the most familiar option. In a noisy party where you can hear multiple streams of sound, your brain is able to hear your own name when pronounced by a guest and to ignore the rest of the auditory information. 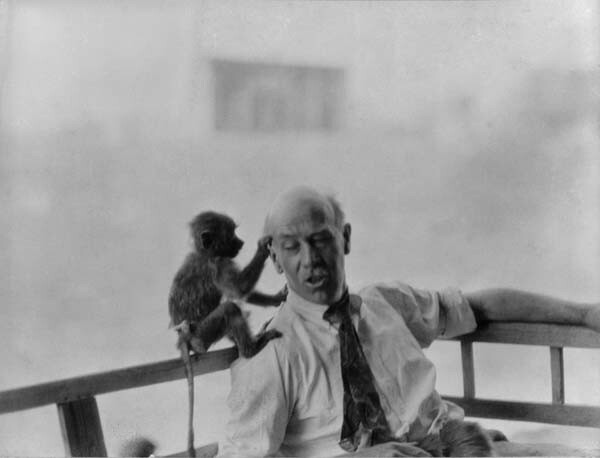 People´s best indicators of what to do with information come from the signals they receive from other people. Non-verbal cues, facial expressions and social proof determine what we do with information. “The majority of guests staying in this very same room chose to reuse their towels” led to a 33% increase in guest reusing their towels, compared to generic environmental messages. People favor short instant gratifications to long-term gratifications. People will usually choose a smaller reward now than a bigger one later. Human are wired to prefer not losing than the possibility of winning. Losses loom larger than gains: Millions of years ago possessions were a result of great effort and sacrifice. Loosing or blunders were mistakes paid with your life. How people feel at the moment of making a choice can change the choice they make. We are suckers for flattery and marketing can help create self-esteem and confidence when consumers need to make a decision. Congratulations! You are about to make an excellent choice… sounds familiar? Human´s innate tendency to save physical and mental energy can work for you. Wired for survival mode, our bodies and brains prefer to choose the easiest and effortless choice. Millions of years ago life was hard enough, it was about saving energy (calories) and mental effort! People use comparisons as an intuitive form of navigation. When lowering prices on sales or discounts never remove the old price tag. People need that anchor to guide their purchase decision. Bonus tracks. I lied to you. There are actually 12 basic instincts in the list. But hey, I am just applying behavioral ideas to my blogging… Had I written: “12 Basic Instincts in Behavioral Marketing”, you would have probably not read this entry (am I right?). Saving energy would have been your choice, reinforced by the Internet’s short attention span environment and context. 10 seems to be our humanoid limit! Go ahead, be superhuman and keep on reading. The Business of Choice, Pearson, 2015. 11. Nature and Nurture drive people´s choices. Genetic makeup, life experiences, Human nature and culture matters. Being right-handed or left-handed, the language you speak, your religion, or if you are the eldest or the youngest of your brothers factor into your decisions. 12. The power of affirmation. Marketing is not only about getting people to buy your brand; it should also be about helping people feel good about their choices. This is key for brand loyalty and engagement. And, we’re done. You made an excellent choice by deciding to read this post! The Business of Choice: Marketing to consumers´s instincts (Pearson, USA, 2015). so others can enjoy it too.